The heart of the Overwintering Project is the Overwintering Project Print Portfolio. 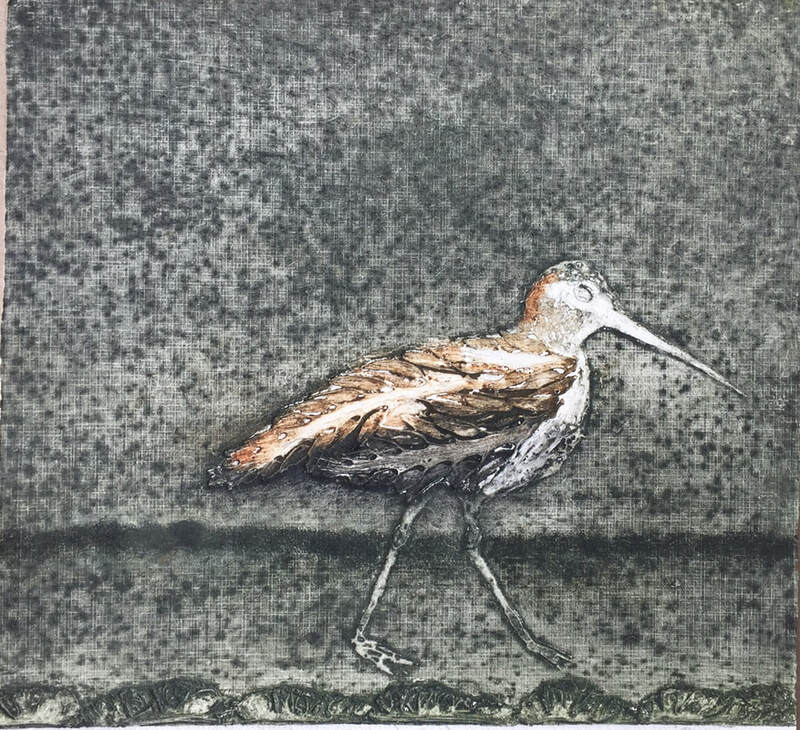 To contribute a work to the portfolio, artists are asked to visit their local migratory shorebird habitat and to respond to it. This is to foster a genuine connection between them and their local habitat. The project is long-term, to give people the opportunity to come to it in their own time, and for as many people to join as possible. 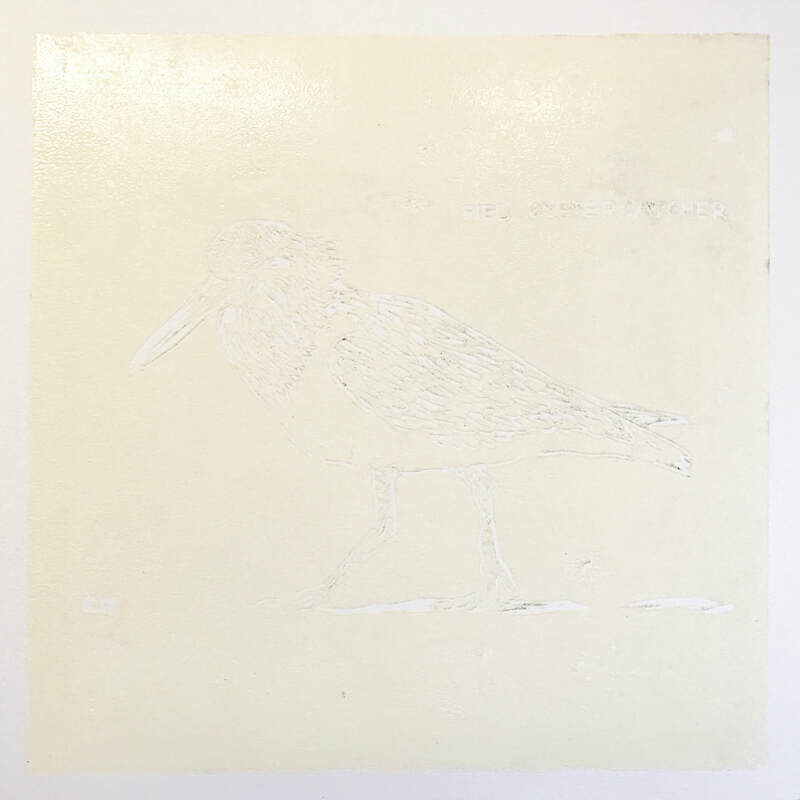 The Portfolio is a collection of original prints in any medium, on paper 28 x 28 cm, made by artists in response to their local migratory shorebird habitat and donated to the project by the artists. As the project’s goal is also to encourage people to see habitat as a complex system upon which many species rely, artists are encouraged to make work about any aspect of the habitat to which they felt drawn. This is why you will see some species other than migratory shorebirds in the artworks of the Portfolio. But most artists have chosen to depict these birds that travel beyond our imaginations. 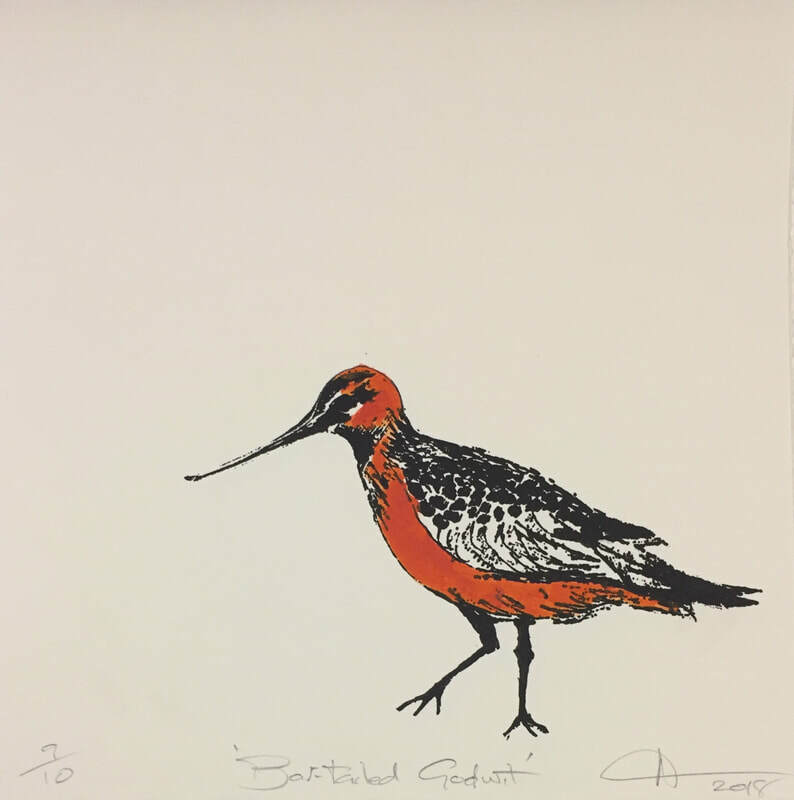 Every artist has donated two of each editioned print to the project, one to exhibit and one to sell to raise funds for shorebird conservation. As the project develops, artists who have contributed prints to the Overwintering Project Print Portfolio will be listed here in alphabetical order. ALTSCHWAGER, Libby; ARMSTRONG, Kate; BANCROFT, Ro; BECKETT, Alexis; BENNETT; Margaret; BEVAN, Angela; BIGNELL, Julie; BLAKE, Dianne; BONSCHECK, Anna; BRERETON, Kurt; BROADWAY, Vivian; BURKE, Gill; CAIRNS, Robyn; CAMLIN, Elaine; CASTALDI, Darcy; CASTALDI, Jennifer; CASTELL, Laura; CHANDLER, Lindy; CHIVERS, Megan; CICCONE, Avrille; CLARE, Helen; CLARKE, Ileana; CLARKE, Leah; CLEMONS, Liz; CLEMONS, Trish; CLULOW, Joyce; COFFEY, Therese; CONDE, Jen; CONNOLLY, Geraldine; COURT, Moira; COWAN, Angela; COWIE, Nicola; CROCE, Beth; DAVIDSON, Brian; DAY, Annie; De LITTLE, Cath; DUFFY, Josephine; ELKIN, Ros; ELLIS, Di; EZRA, Robin; FORMAN, Catherine; FOTHERINGHAM, Rowan; FRANKLIN, Emma; GOODWIN, Trudy; GOW, Britt; HALLINAN, Michelle; HAMMER, Violet; HARRIOTT, Elizabeth; HARRISON, Jeanne; HELY, Anna; HESTERMAN, Heather; HILLER, Kit; HOARE, Domenica; HUDSON, Kate; HUNDT, Robin; HUNTER, Anne-Maree; IRINI, Alexandra; IVES, Bron; JOLLEY, Nadine; KAHLE, Jade; KATSZAPAVLIDIS, Anastasia; KEIGHRAN, Sharon; KING, Hannah-Amelia; KITE, Carol; KNIGHT, Elizabeth; KOCIS EDWARDS, Helen; KOPIETZ, Belinda; LAWRY, Penelope; LEANE, Helene; LEASON, Wendy; LEWIS, Megan; LIESFIELD, Jan; LIVERMORE, Brenda; LOVEJOY FURNELL, Kate; LUNAN, Hollie; MacFARLANE, Larissa; MADDOCK, Negin; MANIFOLD, Marion; MARKS, Margaret; MARSHALL, Lisa; MARTIN, Patricia; MARTIN, Sue; MAY, Edith; McCAFFERY, Victoria; McCOY, Cheryl; McDONALD, Gina; McDONALD, Steve; McFADZEAN, Peta; McINTOSH, Valerie; McPHERSON, Megan; MILES, Anne; MILTON, Julie; MINGUNDOO ALLWOOD, Gret; MITCHELL, Sarah; MONEY, Catherine; MOSS, Nicola; NEAL, Karen; NEWTON, Josie; NEWTON, Suzanne; NICHOLSON, Bridget; NOVA, Maria; O’BRIEN, Paul; O’CONNOR, Sally; OPPEN, Monica; PILON, Fay; POGGIOLI, Sue; PULFORD, Mary; RAVICH, Katie; READE, Gaby; REES, Bronwyn; RICE, Trudy; RILEY, Angelina; ROBINSON, Sandy; ROGERS, Jennifer; RUSHFORTH, Susan; RUSHTON, Margot; SANZARO-NISHIMURA, Jenny; SAUNDERS, Nyrel; SCHUBERT, Ruth; SEEGER, Carol; SHELLEY, Luke; SPOHR, Trevor; STRAZZARI, Michelle; STUERZL, Jennifer; TANDBERG, Trudy; TASKER, Gwenn; TAYLOR, Kerrie; THOMPSON, Ruth; TIMBURY, Helen; TOP, Sue; TSERONIS, Emilie; UPTON, Evelyne; VALPIANI, Cate; VASSELEU, Cathryn; WARD, Peter; WARREN, Marama; WATANABE, Kay; WATTS, Amanda; WHITE, Jenny; WHITE, Margaret; WILKINS, Therese Gabriel; WILLIAMS, Sandra; WILSON, Penny; WISEMAN, Diana; YOANNIDIS, Stephanie; ZAKARAUSKAS, Valé; ZUBER, Patricia. 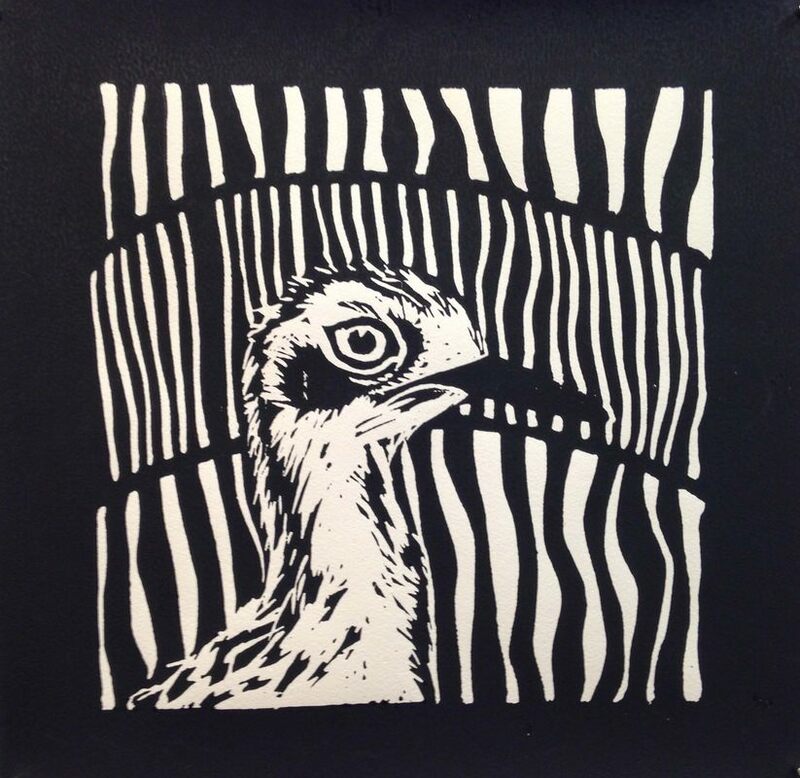 On the 8th April, 2018 printmakers from Adelaide, Melbourne and Mt Gambier joined Kate Gorringe-Smith at Racecourse Bay, Port MacDonnell for a field trip to study the shorebirds and their habitat. It was a very successful day with many birds along the shore providing much inspiration. Site: ​Racecourse Bay, Pt MacDonnell, se SA. The presence and absence of birds in a place indicates the overall health of that place - of the world. The more species in healthy populations that are present, the healthy the environment. Birds are also beautiful, joyous and extraordinary and they do many things for us assisting in pollination, insect control, soil and sand aeration etc, and they do it all - for free! They are interwoven into our lives in many ways, some of which we are totally unaware of - and yet we are destroying their habitat and ignoring their right to life. The loss of birds that we are now witnessing worldwide, is not only terribly sad, it is shocking and is as much a loss to mankind as it is to the birds themselves. I hope my small contribution to this wonderful project, can in some way help others to stand up for birds in all their forms - not just become aware of their loss, but fight for them. 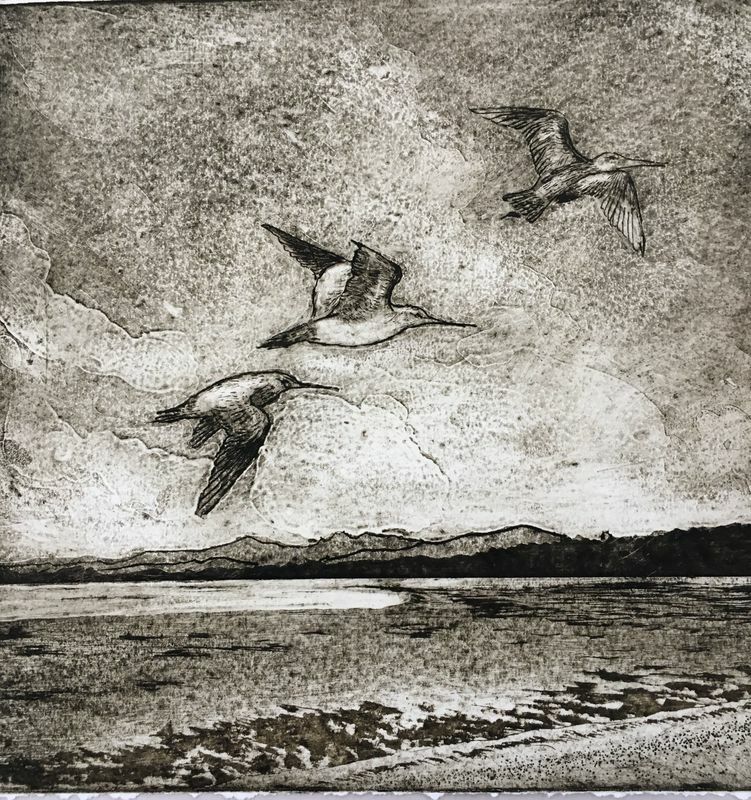 In February 2018, I joined a group of printmakers at Point Lonsdale to be taken by shorebird expert Robyn Atkinson to Victoria Lake, where we learned about the amazing flights of these migrating shorebirds, their feeding habits and the importance of wetlands in their journey each year. Previously I had no idea these little birds flew such amazing distances. But the thing that had the greatest impact on me came out of a conversation with Kate about how the wetlands were not only under threat in countries along the birds flight path but here in Australia as well. So I chose to depict wetland habitat, for if there is no habitat there are no birds. The astonishing journeys undertaken by small migratory birds to and from their breeding grounds every year are known to many people. But these tiny individuals, their songs, their personalities and their way of navigating the world are a mystery. This work is a memorial to them as their numbers decline along with their places of refuge in my city, Melbourne. Site: Skeleton Creek quietly meets the sea on the west side of Port Philip Bay. Located south of Melbourne, it is part of the Cheetham Wetlands and close to the Werribee sewage farm. Its low scrubby shrubs and fragrant salty tidal zones are enclosed by suburban sprawl and a big sky. Many wading birds, tiny grey brown fluff balls, spend summer in this refuge resting and fattening up before the returning to the northern hemisphere to breed. I have lived on King Island almost my entire life and seen the migratory birds come and go with the seasons even though the coastline is in a state of constant change. That migratory birds can and do fly non-stop for days and days always inspires me. Some of these long-distance migrants are very small, weighing only 50 grams. Migratory birds depart King Island in late March, and follow the East Asian-Australasian Flyway. Their mission is to arrive at their breeding site, find a mate, incubate and raise chicks, thereby ensuring the continuation of their species. The dedication of such vast numbers of birds to follow their instinct by flying from the southern to the northern hemisphere to breed and return again when their chicks become independent is one of nature’s marvels. 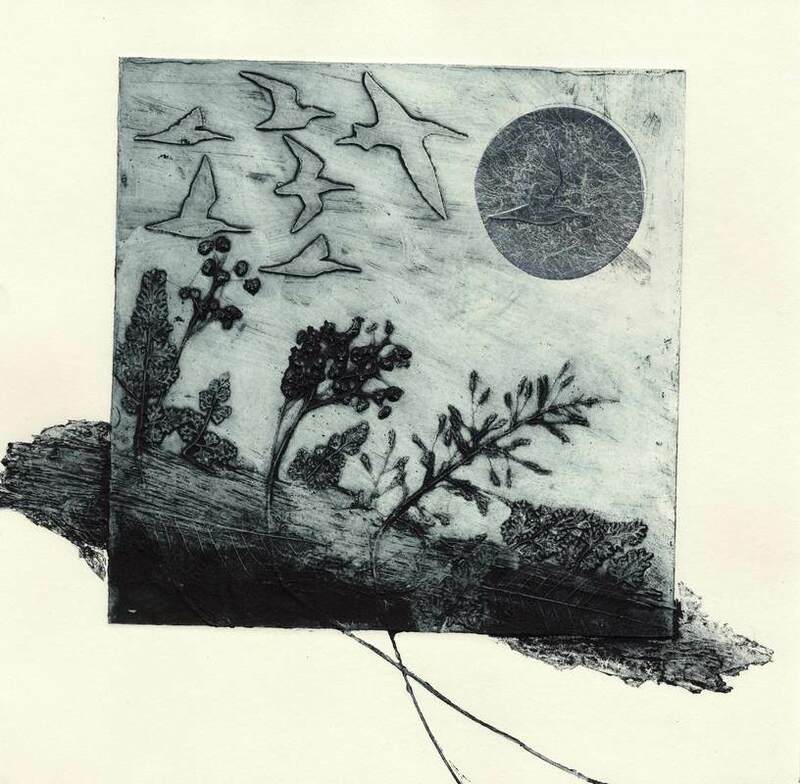 My print is of some small migratory birds resting in the moonlight. The south-east coastal region around Port MacDonnell, includes areas such as French Point, Stony Point and Danger Point. These areas provide a rich source of food for many migratory and residential birds as well as offering shelter and camouflage. 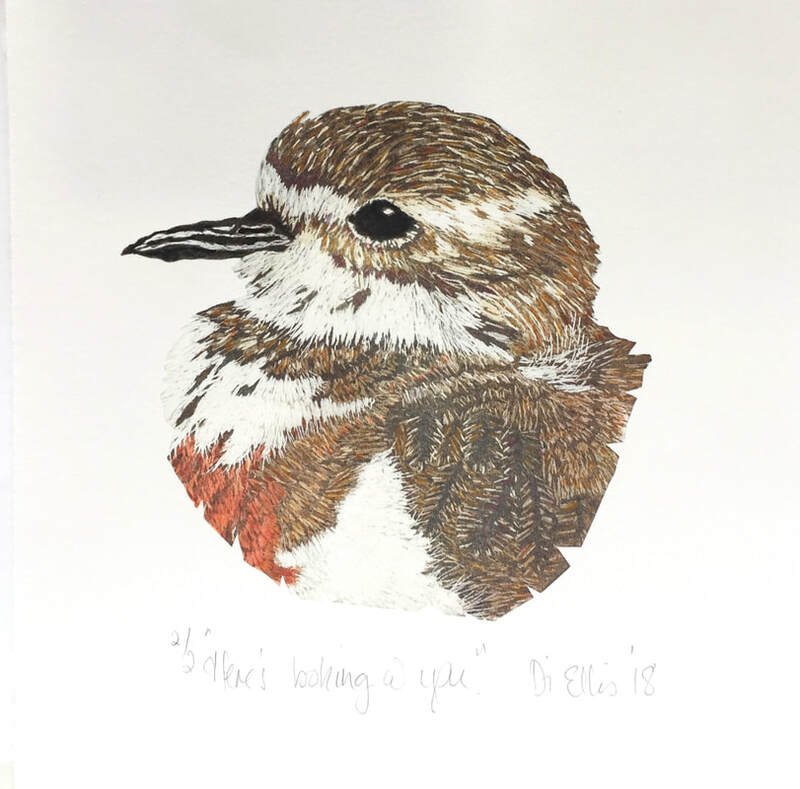 During a recent field trip by the Thumbprint Printmaking Group we were lucky enough to see Ruddy Turnstones, Red-necked Stints, Little Plovers, Sandpipers and Sanderlings. Many of these small shorebirds were scavenging on the beach and in the rockpools at Port MacDonnell. 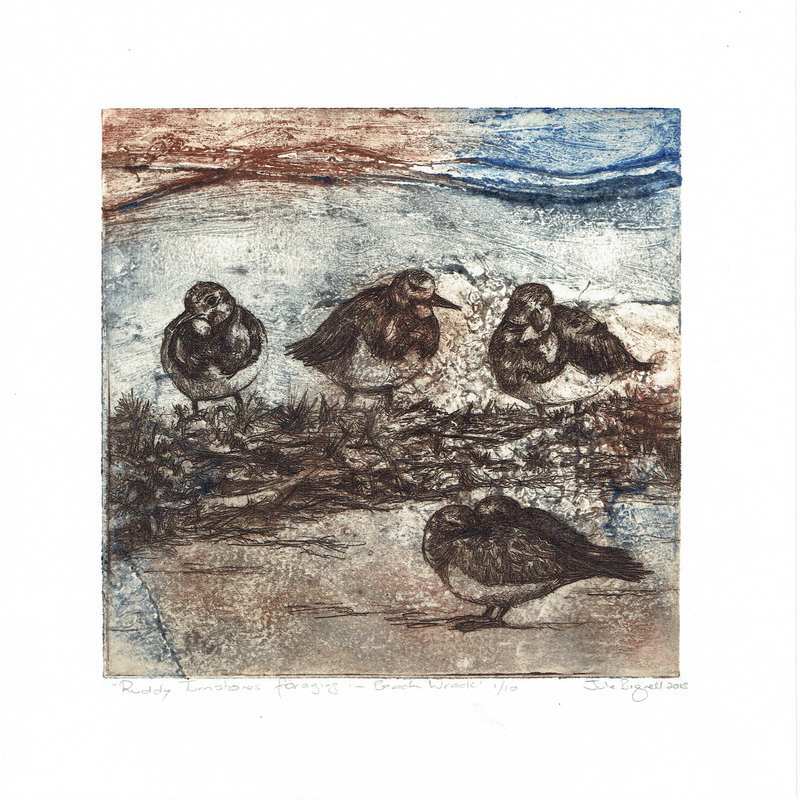 My print depicts Ruddy Turnstones foraging in the beach wrack at Danger Point. Beach wrack incorporates organic material such as seaweed – kelp and seagrass that is cast up onto the beach by the tide, but unfortunately can also include marine debris such as plastic, glass and metal. Title: Ruddy Turnstones Foraging in Beach Wrack. Watching out for the arrival of the migratory birds on the shores of the wild coast of King Island Tasmania has become an intriguing obsession and a seasonal calendar. A deep fascination has developed. To see the first arrive is a special moment, and then watch as numbers grow. I look forward to the return each year with anticipation, hoping the numbers are as strong as the previous year. The perils they face, diminishing habitat, pollution, global warming and climate change all impact on these courageous creatures. The Bar-tailed Godwit is one of many migratory birds that visit King Island. I saw them for the first time last year. The flight of the migratory birds has me astounded and amazed at the extraordinary feat of flying from the Northern Artic regions to our shores. I feel fortunate to witness this, knowing how far they have flown and realise how important projects like the Flyway Print Exchange and the Overwintering Project by Kate Gorringe-Smith are to bring about greater awareness to the plight of the migratory birds both here on King Island and all through the Flyways. Derrit drit, derrit drit, derrit drit. From where they are long gone. I have printed using white (cream) ink on white paper. This is to emphasise the endangered (loss/disappearance) status of the shorebird. 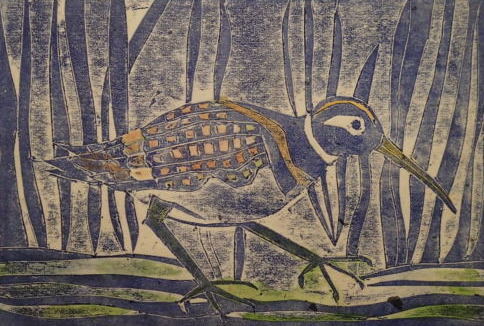 I enjoy lino printing and I love nature! Living in the sandbelt region of Port Phillip Bay, its not surprising my main influences are the local surroundings; from the foreshore reserves to the heathlands, wetlands, even my own garden or my neighbour’s! I’m so glad to be part of a project to raise awareness of Australia and New Zealand as being the major destinations for migratory shorebirds of the East Asian-Australian Flyway. Its wonderful to realise that our artist community is getting involved and can play some part in preserving their habitats. I’m also really looking forward to seeing all the artwork produced for a good cause! I’ve portrayed Bar-Tailed Godwits as I’ve seen them, in silhouette, flying over the Central Coast of New South Wales on their way home to Alaska. They overwinter at Tuggerah Lakes having undertaken incredible journeys - one bird flew 11,500km non-stop in nine days from Alaska to New Zealand - the longest non-stop flight of any bird in the world. Despite this tenacity, they’re still near threatened so the protection of local habitats is imperative. While council has undertaken action to protect the important Tuggerah Lakes salt marsh environment this and other sites will require ongoing maintenance and development if we are to continue to welcome these amazing visitors to our shores. 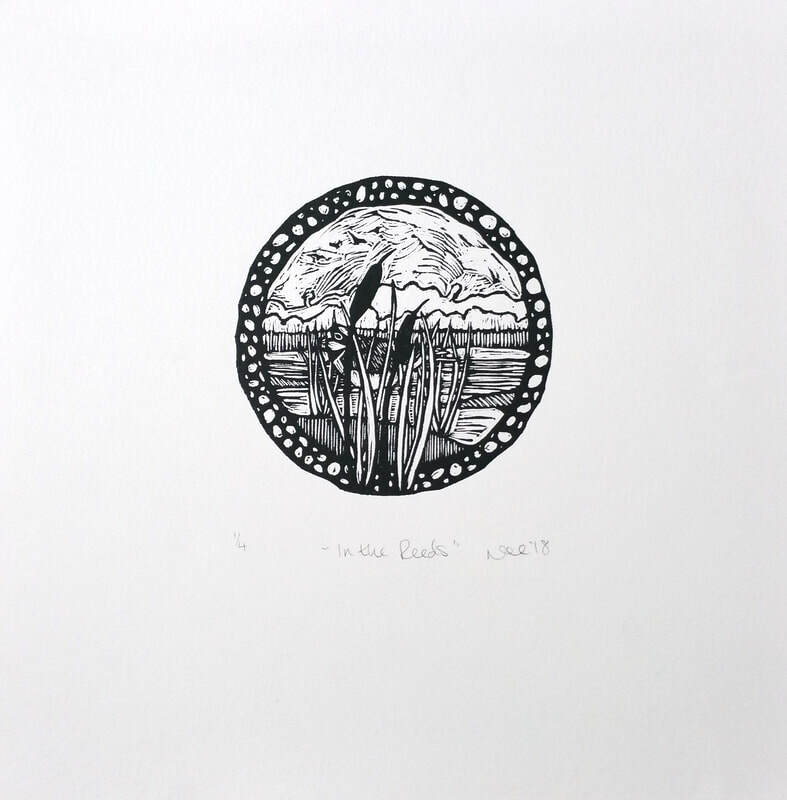 My print depicts a haiga poem (haiku and image come together) where one of my students is dreaming of the Latham's Snipe after an outing birdwatching at the Western Treatment Plant in Werribee. This is one of my favourite places to view migratory shorebirds and observe birds because it's a place of arrival, big skies and tranquillity. 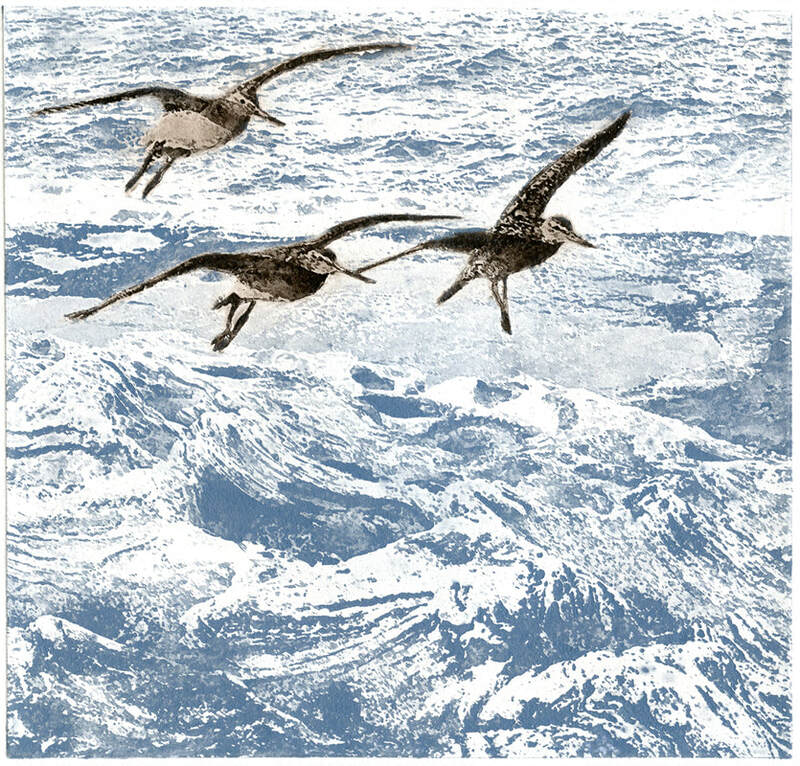 The Latham's Snipe is in flight as a symbol of the aerial view of the world on its journey from Japan to Australia. Kaizen is a Japanese term that means ‘change for the better’. 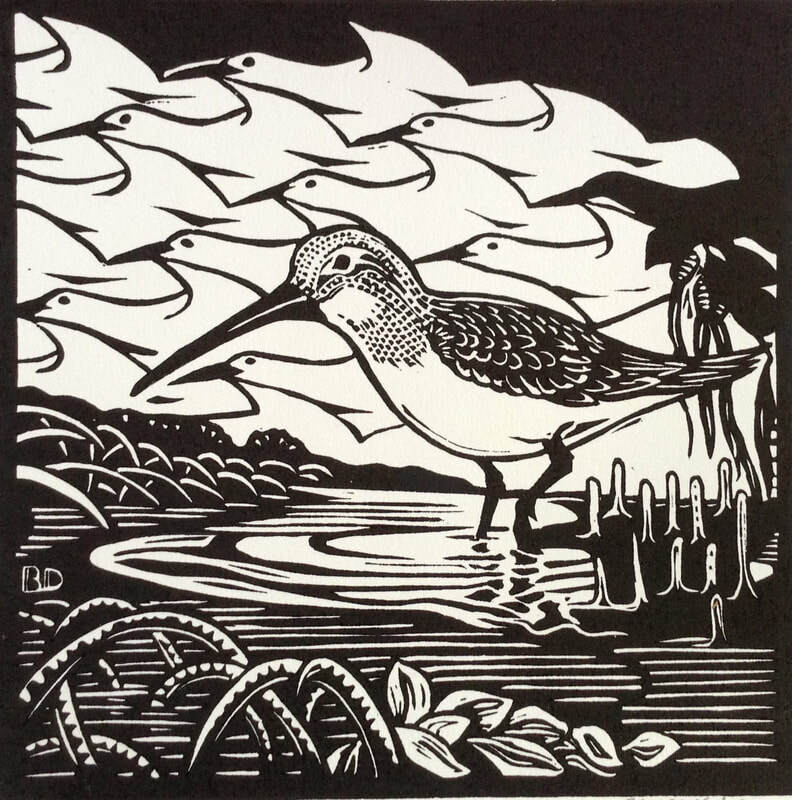 In creating my print I imagined the Latham's Snipe happy for my students actions to help local habitats for the future of all. Walking through Fivebough Wetlands, an inland swamp located on Wiradjuri land in the Riverina, the ecological impact of a dry season was evident. The species of birds during the overwintering period had been lower than in previous seasons, initial disappointment subsided as we moved through the track, our mere presence in this environment provided overwhelming inspiration. The dragonfly I followed through the native shrubs was a gentle reminder of the diversity of species present. Responding to our visit, I developed a print which embodies the calming sounds of the environment through subtle colours and marks, and detailed and meditative line-work. Darcy's subjects are focused on industrial areas around Newcastle, Kooragang and Stockton - which happens to be one of the safe havens for the migratory birds to stop and rest. Bridge and rail structures are a feature of Darcy’s work and he seeks to document the big picture as well as the small details. 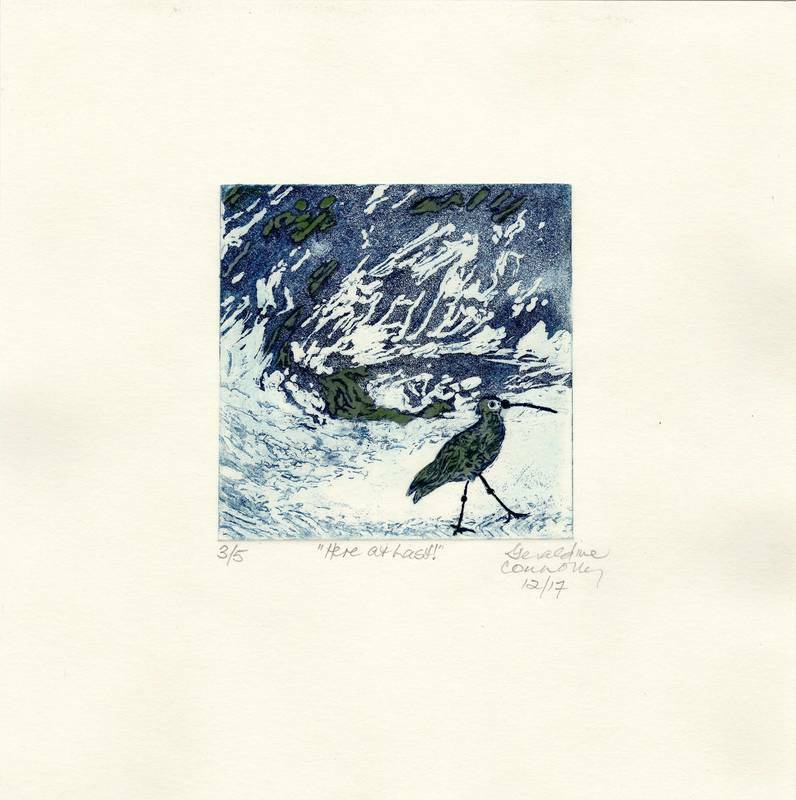 Jennifer Castaldi is a printmaker and architect living in Newcastle. 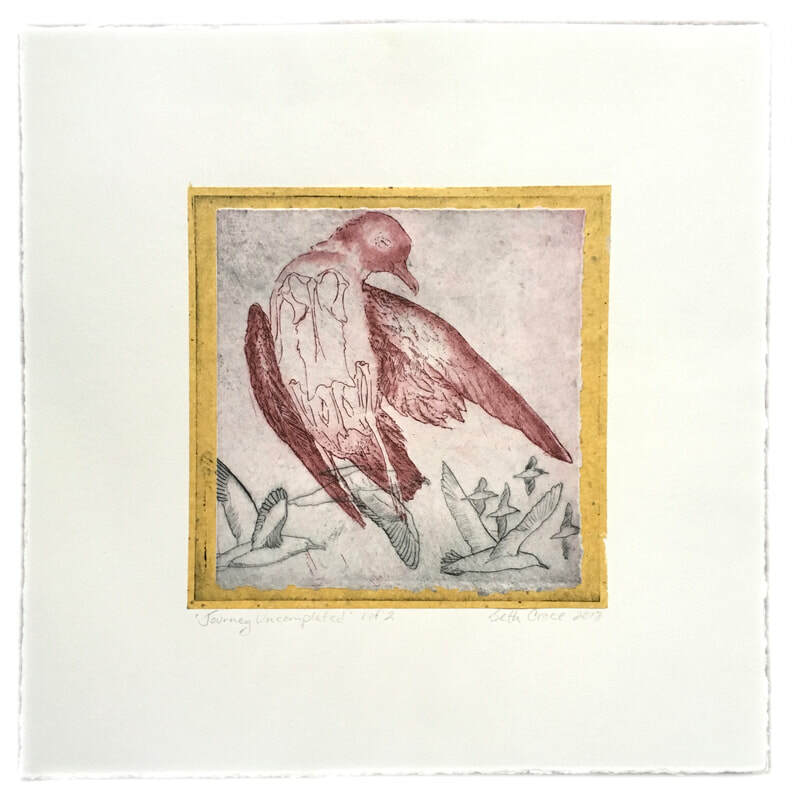 She enjoys printmaking for its combination of mastering the technical skills and the element of surprise that evolves from each print produced. She is interested in how the natural and human built environments interact around the coastal regions. The animals and birds often find a place of safe harbour in manmade structural creations. The Overwintering Project was a way to find out more about a little creature and its habits – The Painted Snipe. The Esplanade in Cairns (North Queensland) is visited by a variety of shorebirds that seem to happily spend their time feeding and walking along the mudflat. The Black-tailed Godwit is one of these birds which can still be seen in good numbers at specific times. By incorporating some small but obvious areas of ‘landscape’ within the bird, I tried to capture its transient nature in time but also as a symbol of their vulnerability to the conditions of the environment they inhabit in their long travels. Site: The reference for this image was taken on the Cairns Esplanade in North Queensland during October 2016. This coastal area has a very gentle slope that exposes a wide mudflat during the low tides, where the birds spend time feeding and wondering around. This print is my personal response to the importance of conserving the natural environment of the Broadwater on the Gold Coast, Queensland. Currently there is a proposal “The Broadwater Marine Project” which is offering development rights to parcels of government land and seabed on the Broadwater Queensland, in total 81.4 Ha in exchange for the construction and operation of a cruise ship terminal. This development will see the removal of a large shorebird foraging area and the possible destruction of the main shorebird roost in the Southern Broadwater. 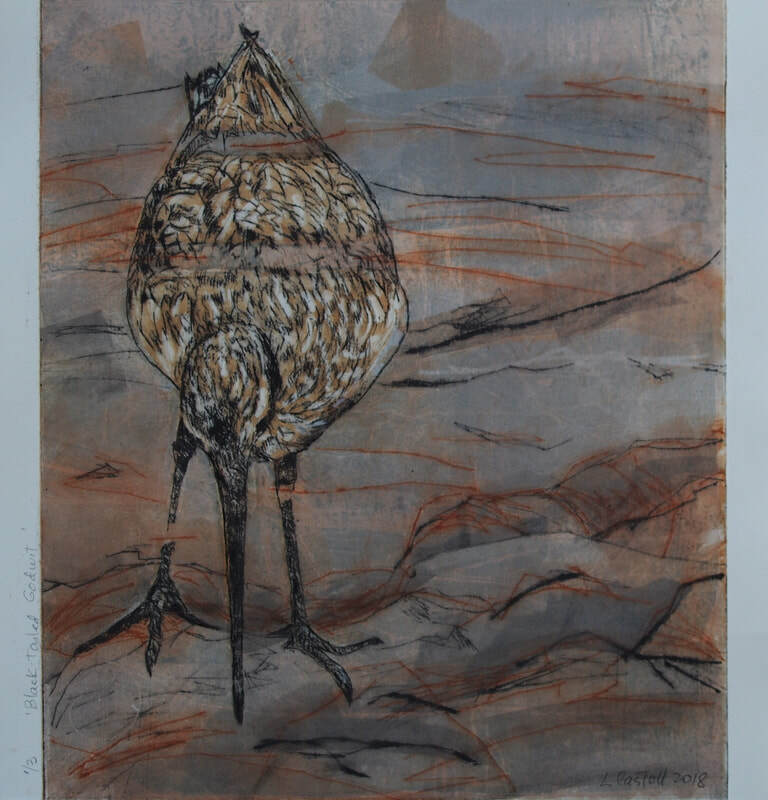 My works are a visual reminder of the urgent need to preserve the balance of nature on which shorebirds survival depends. It is my effort to awaken awareness of a little migratory shorebird known as the Bartailed Godwit – limosa lapponica- which restores itself on the Broadwater for its journey home. The act of migration is exceptional as is the distance flown by this little bird. In 2007 a female Bar-tailed Godwit was tracked flying 11,680 kilometres from Alaska to New Zealand in nine days straight. It is the longest recorded bird flight on the planet. It seems perverse that a bird that can fly enough to get to the moon in its lifetime should be so fragile, but the Bar-tailed Godwit and its fellow shorebirds face enormous perhaps insurmountable challenges. These shorebirds aren’t just declining in the abstract sense, they are heading toward extinction. Everytime a species become extinct we lose something we can never get back. The inspiring Overwintering Project: Mapping Sanctuary raises awareness of the plight of migratory birds and their epic flyways. I was drawn to sharing the journey of the Short Tailed Shearwater, a seasonal part of growing up on King Island. Mutton birds or moon birds as they are known to some are migratory heroes, their cycle in Tasmania an ancient rhythm embedded with local rituals. These lino prints use techniques gleaned from our printmaking workshop with Kate, hand-cut stencils depict the mutton birds' journeying from King Island, over many seas, northward bound. Local seaweed depicts our sea, dried oregano stalks and flowers offer a likeness to our predominatetea trees. Ink colour is the almost regal Prussian Blue. 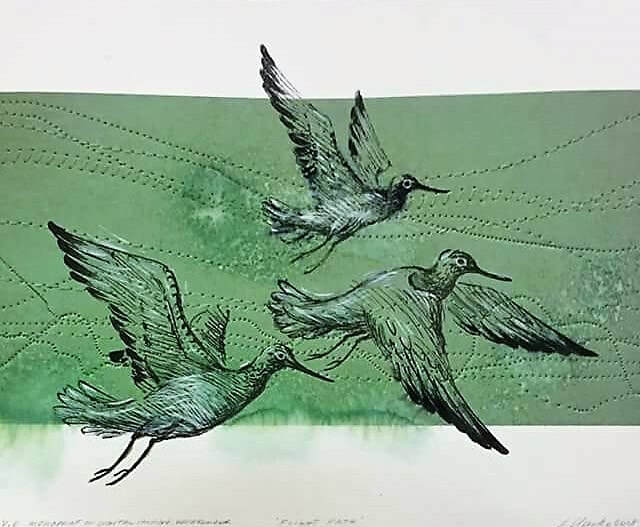 I chose to show the Bar-tailed Godwits in flight because I read that not only do they fly extreme distances but one, E7, broke the world record, flying between Alaska and New Zealand in a 9 day non-stop trans-Pacific Ocean flight. I imagine they must see such varied scenery, including our own spectacular coastline. The Black-tailed Godwit is an uncommon bird - rare - small flocks or singularly. Frequents coastal tidal estuaries and sandy shores. Arrives in Australia from Northern Europe and Asia during October, departing in March and April. Breeding season June & July in North Europe, North Asia, Mongolia, Siberia. 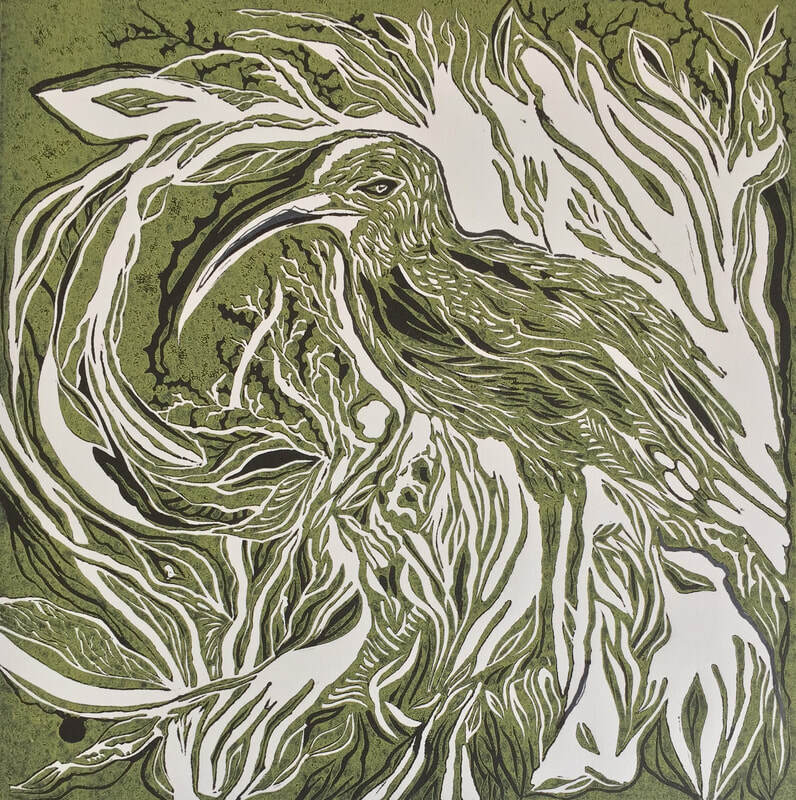 Because of its rarity, the black tail and long legs, I chose to do a linocut, embossed and monotype. The Common Greenshank is a large wader that is rarely seen in groups and lives in muddy margins of estuaries of the Newcastle wetlands in NSW. They fly thousands of miles from their breeding grounds in Siberia to warmer climates of Australia.After resting and thriving on Australian shores they leave from February to early March returning to their breeding grounds. 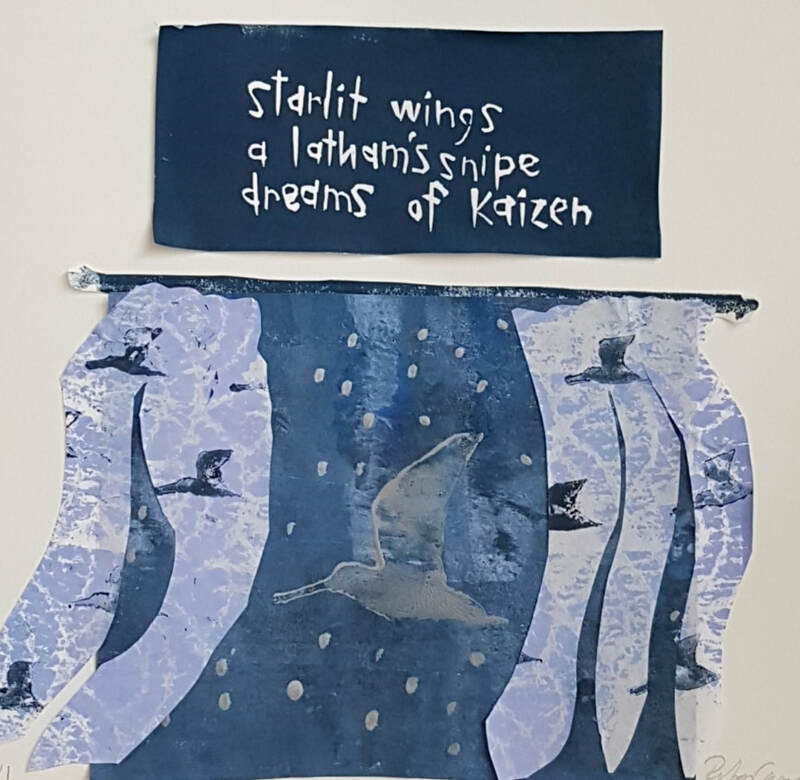 My work is layered with a background digital image of stitches, implying a long flight path, overlapped with monoprint and hand painted Greenshank shorebirds taking flight. After resting on Australian shores, they return to their breeding grounds from February to early March. These amazing migratory shorebirds are threatened by coastal developments along their flight path and as such their numbers have lessened.This project has made me aware of the dire situation birds are facing; therefore I will endeavour to protect our environment. 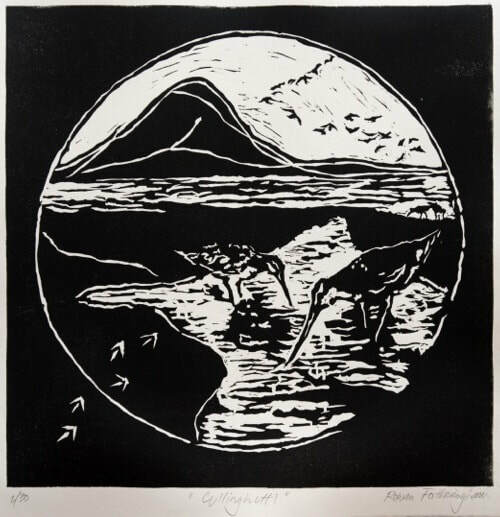 As a recently retired Early Childhood teacher, and a new-comer to the artistic word, I am wallowing in the joy that I once allowed my students; that of exploring and creating in the medium of printmaking. Here on King Island we are so fortunate in having Dianne and Andrew Blake to guide and support us kindly in our experiences. 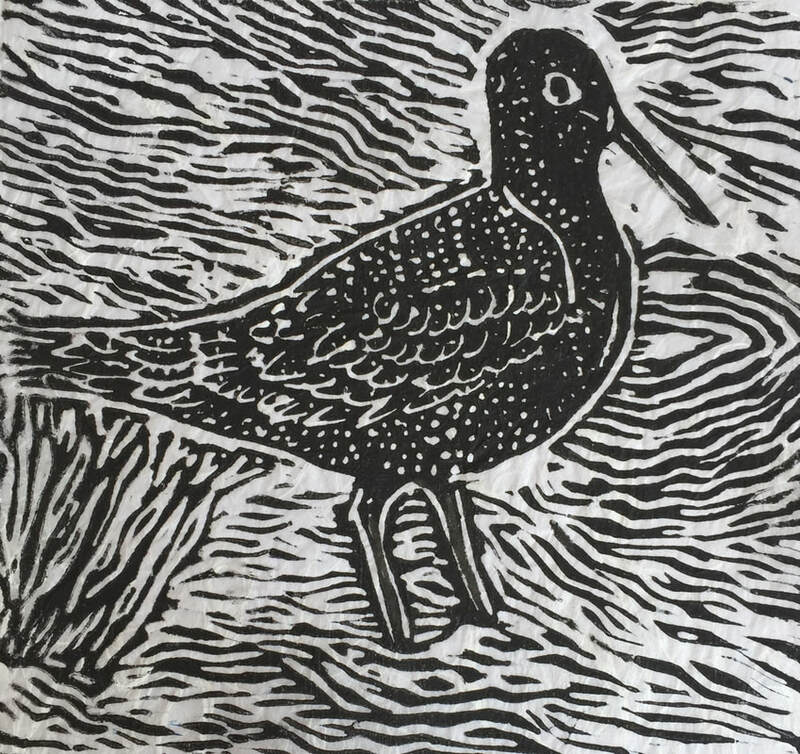 Kate Gorringe -Smith expanded our printmaking skills whilst enriching us with a deeper appreciation of migratory shorebirds. Although my everyday interest is with the many birds that visit our garden, I was very happy to go adventuring with Kate. I hope you enjoy my results. I grew up on King Island and have spent many a day walking along the wintery west coast beaches seeing those amazing little ruddy turnstones and being fascinated by the shearwaters (muttonbird) and that their migration went all the way to the Aleutian Islands and back to the same burrows each year. 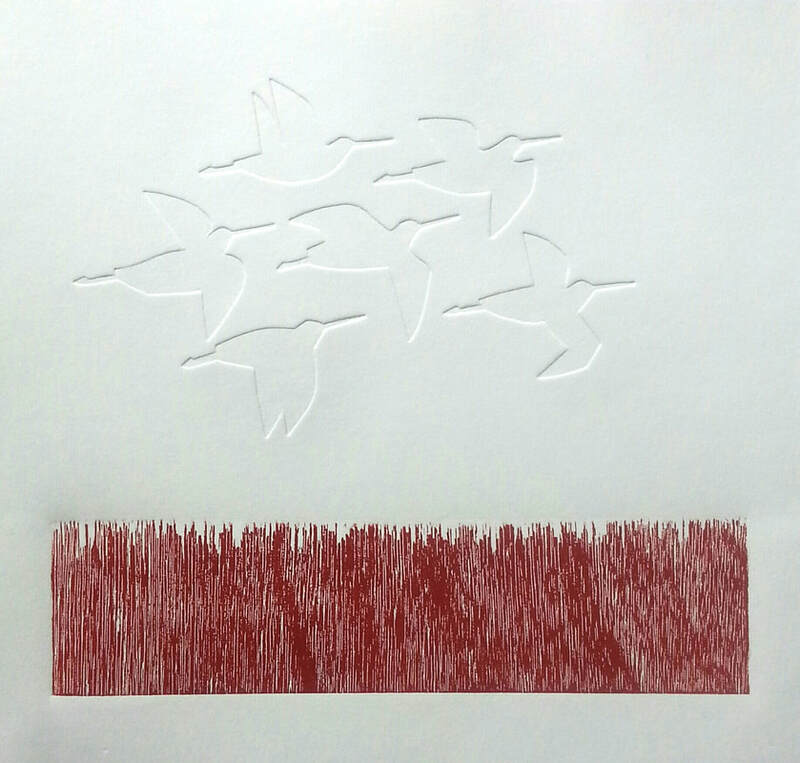 Experimenting with printmaking has given me an opportunity to represent the flight of these incredible migratory birds. Wood Sandpiper: An uncommon bird in Australia. Frequents fresh water, swamps, particularly where there is aquatic vegetation, shellfish and insects. It swims well and also perches on trees. Distribution: Northern Eurpoe and northern Asia, India, Malaysia and Australia. It has been recorded that the Sandpiper frequents all mainland states incuding Tasmaina. Nest: A depression in the ground. Eggs: Four bluish eggs with spots and blotches of dark purplish red. ​I live on the rugged cliffs of Cape Bridgewater in the far South West corner of Victoria. This environment has influenced my art practice in many ways. 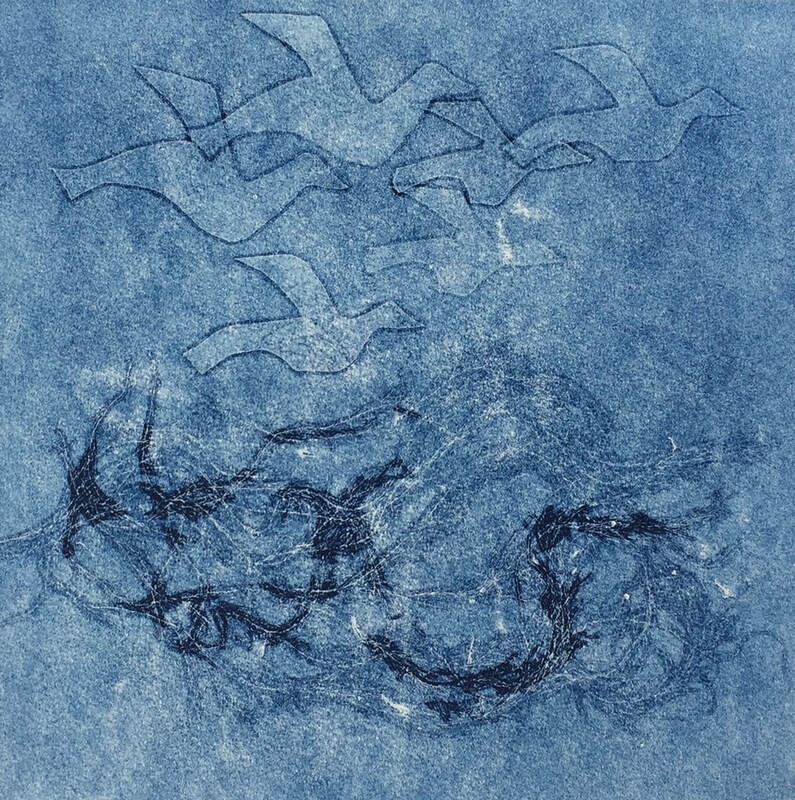 Having been a printmaker for many years, primarily screen printing and dry points, I particularly like the imperfections that occur in both processes leaving unfinished lines to conjure the viewer’s imagination. The Bar-tailed Godwit is an extraordinary migratory bird, and to endure such long distances is unbelievable. 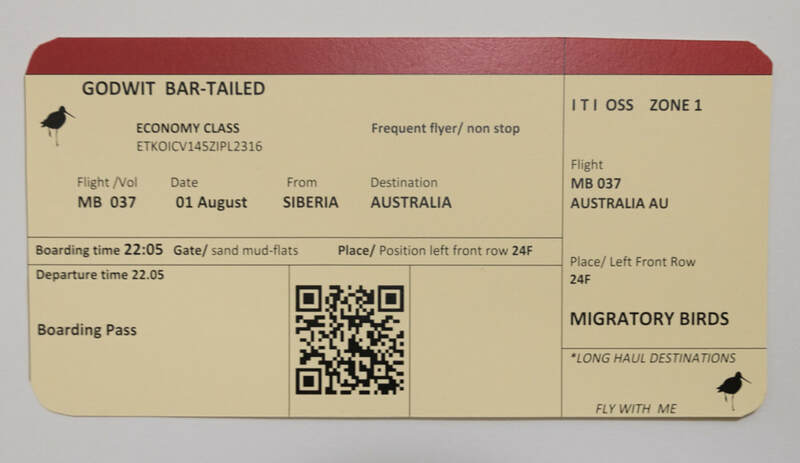 The 'boarding pass' print is a witty presentation of the Godwits' marvel. 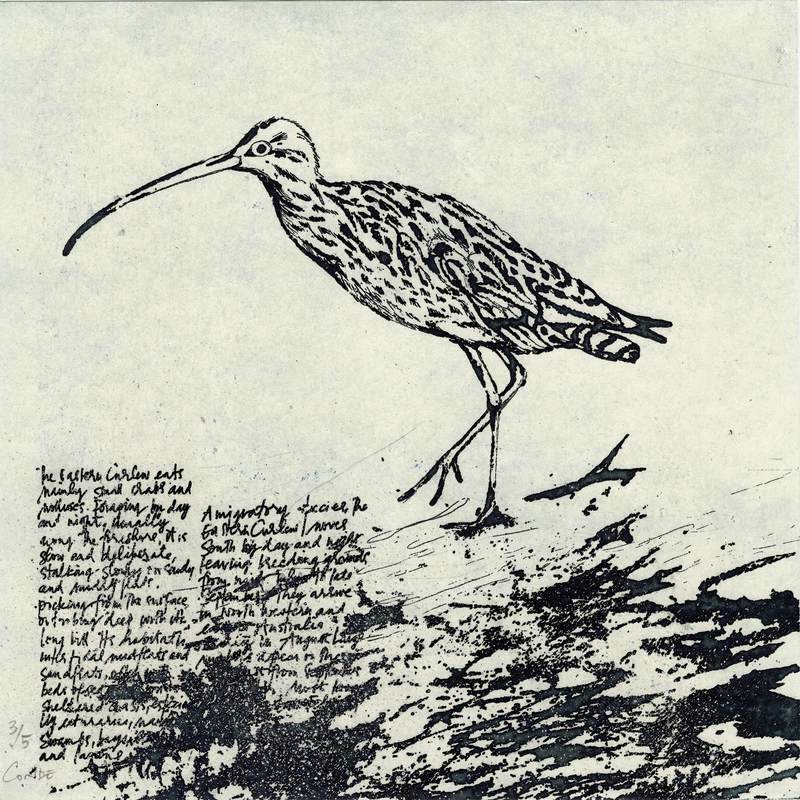 The Curlew has a haunting distinctive call. These beautiful birds, the largest of all waders, migrate from northeastern Asia, including Siberia and Mongolia to winter in coastal Australia. They can be found at Canaipa Point in Moreton Bay where the artist has observed their foraging and listened to their calls. The Eastern Curlew occurs only in our East Asian-Australasian Flyway so we have a particular responsibility to protect our coastal wetlands for them to survive. 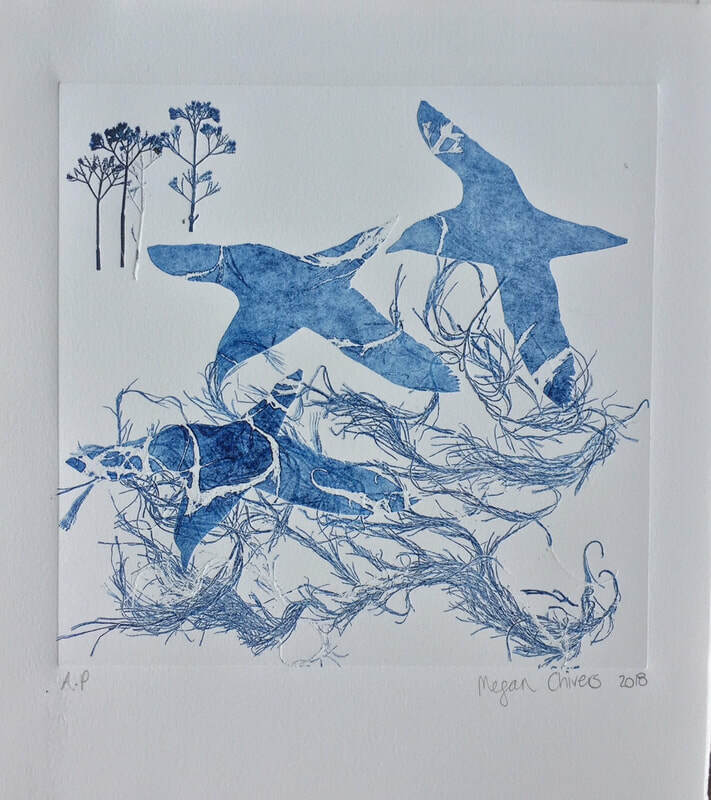 Jen’s prints and paintings explore her love of water and her ‘place’, where she lives on the shores of Moreton Bay. She currently exhibits paintings, prints and artists books in her solo and group exhibitions held across Australia and internationally. Jen has won various awards and has work in the National Gallery of Australia print collection and the National Library of Australia Collection. On his spindly, knobbly kneed legs, the Eastern Curlew struts bravely on the water’s edge of Moreton Bay, in South East Queensland. From Siberia’s lush feeding grounds after the winter’s thaw, in late spring and summer. The flocks enjoy a feast of insects and grubs. Food galore! Then as Autumn approaches and spring begins at the other end of the world, great flocks take flight to over winter in warmer climes. On the shores of Moreton Bay, with change of tides, muddy mangroves on the river and creek edges, they find much need for food. For on the journey over they have lost half their body weight! Avoiding all the obstacles en route – pollutants in the Yellow Sea – oil, diesel floating on the water, plastic detritus, fishing nets, and general garbage as humans encroach with housing and industrial development on once pristine shores. Cargo ships, small boats, planes coming in to land. And then the dangerous pathway between North Korea and Japan with destroyers and missiles from land and sea. And still only half way there! But it’s OK. Here he is protected with his speckly camouflage. Here by law he is a protected species. Let’s keep his habitat safe and clean! 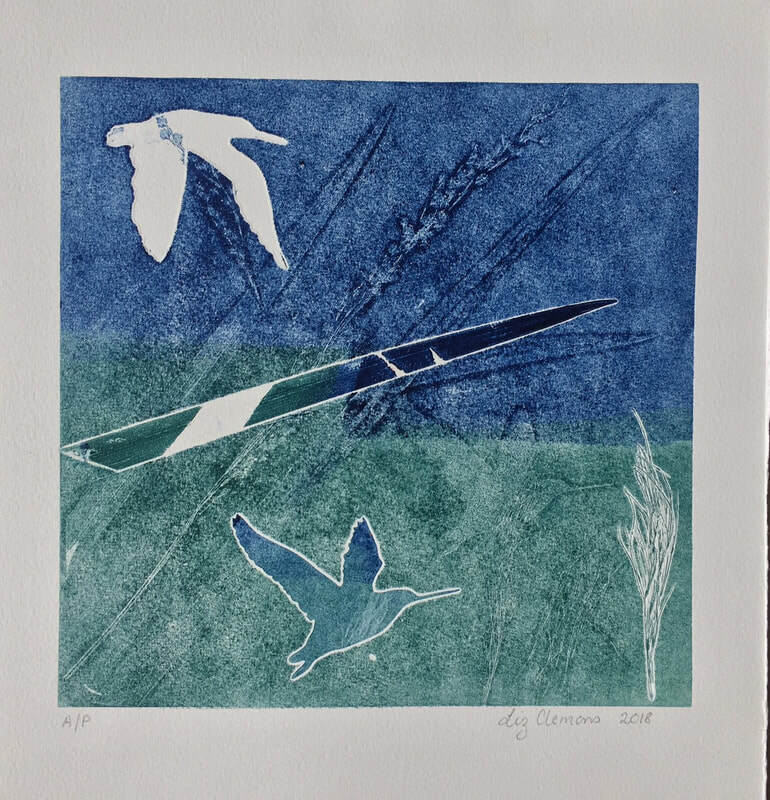 I visited the South Western corner of Thomsons Lake at Beeliar Nature reserve in West Australia too late in the year (May) to see any overwintering birds so my print, Sky Tracks, is inspired by the rusting typha reeds fringing that part of the lake and animal tracks in the sand. 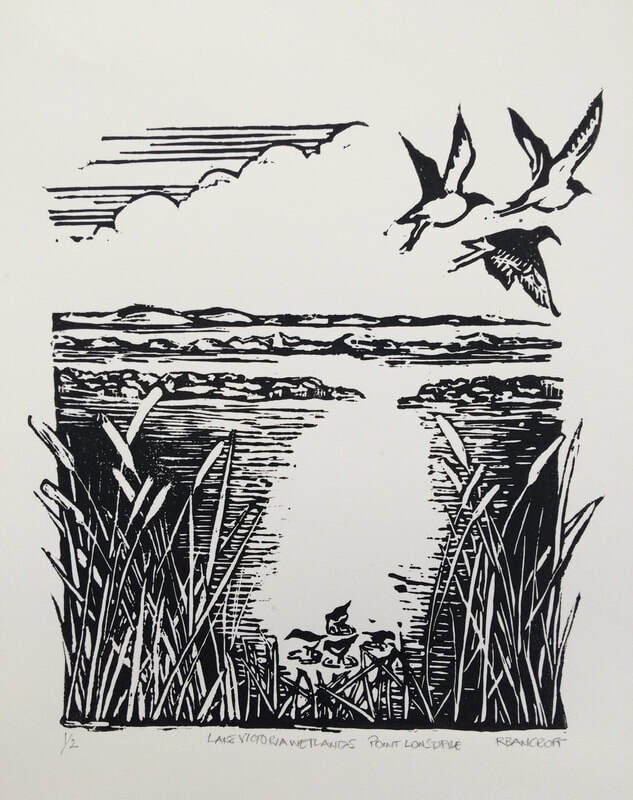 The typha reeds are printed from a woodcut and the flying Black-tailed Godwits, who are known visitors to Thomsons Lakes, are embossed with a plate made from cardboard. Curlew Sandpiper wading at Kooragang Island. 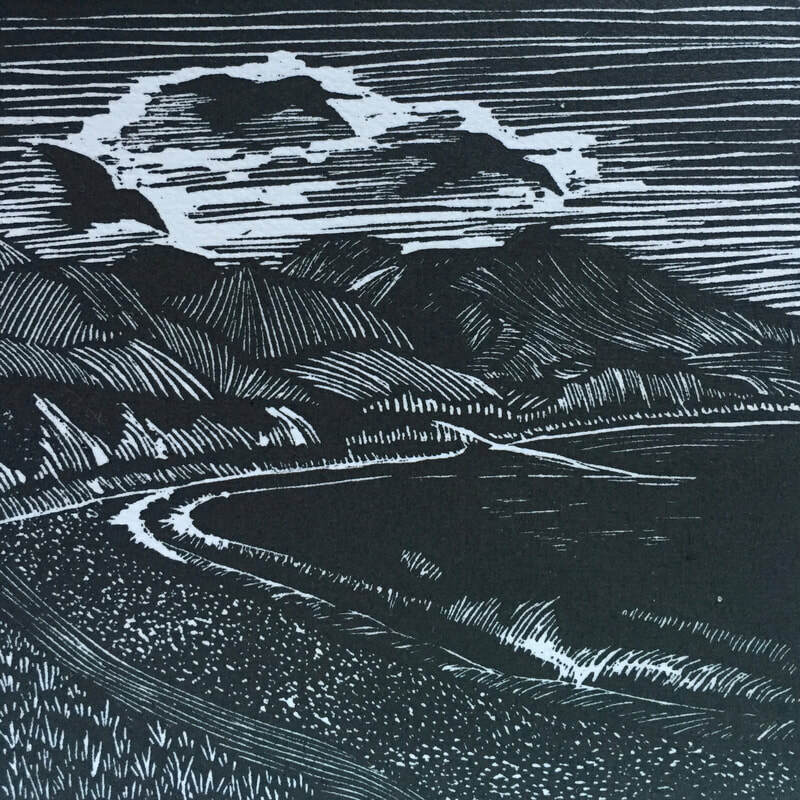 I created this linocut print in response to my visit to Thomsons Lake, south Perth in Western Australia. I visited in early winter after a very dry autumn so the landscape was wide and marshy with lots of grasses and a little water in the distance. I loosely recreated the landscape of Thomsons Lake within an organic pebble-filled border which acts as a window on to this small scene to consider the vista before seeing the bird hidden in the grass, which is the experience common to finding these birds in their habitat, usually well hidden. Site: Thomsons Lake, south Perth in Western Australia. This work was inspired by shocking news images of thousands of small, darkly feathered bodies littering beaches from Gabo Island to Portland and down to Tasmania, in the spring of 2013. Our local beachside councils were overwhelmed and scientists perplexed. The cause of this die-off eventually became clear: exhausted and emaciated after poor feeding conditions in the northern hemisphere, the short tailed shearwaters were unable to cope with storms en route to their specific nesting locations in south-eastern Australia. The challenges for these feisty birds mount as they rely on evolution and instinct to negotiate a rapidly changing world. 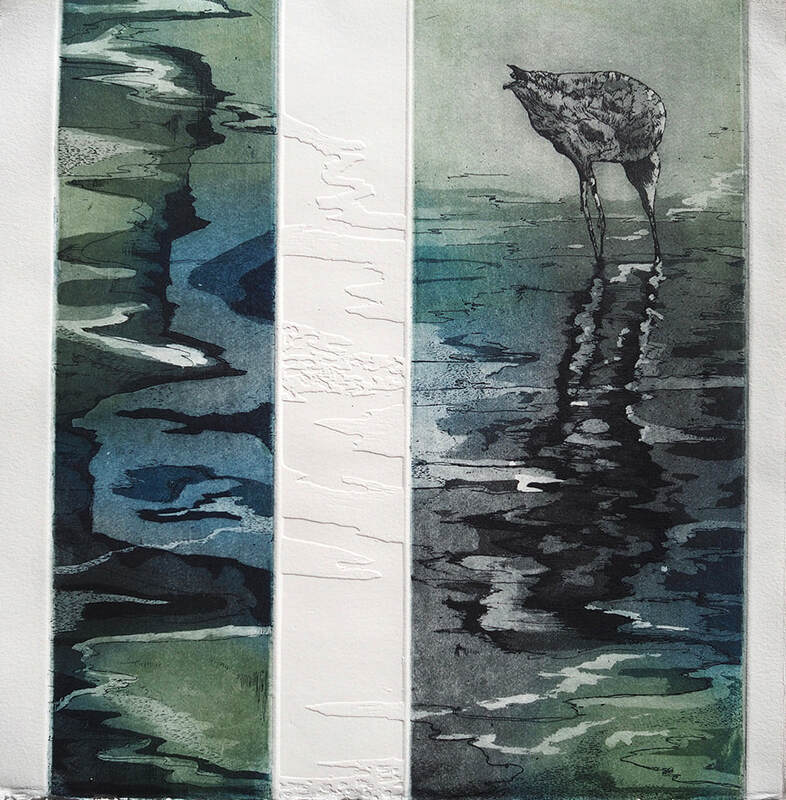 These prints are inspired by the littoral zone of my home town, Lennox Head, NSW and Hervey Bay, QLD where I often visit and can observe migraters feeding as the three metre tide expose sand flats. I have been making Lino prints for one year and am pleased to find the medium opens technical and creative avenues. 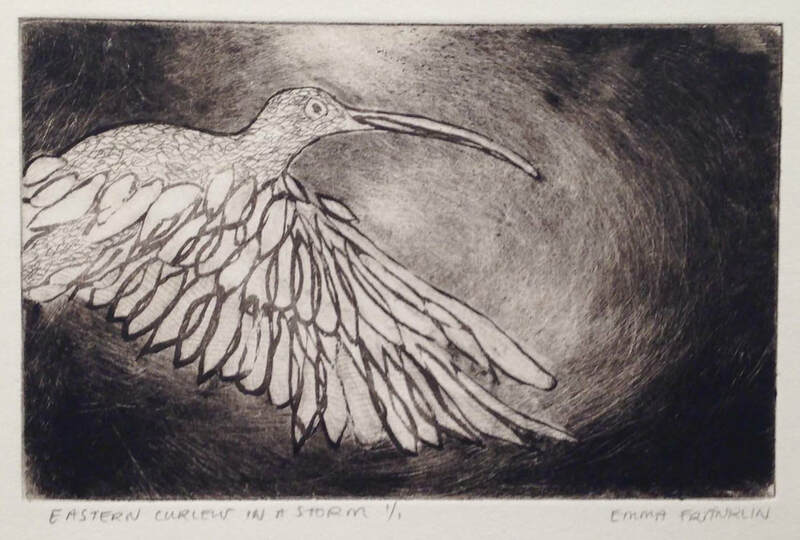 I intend to look to other forms of printmaking in future, particularly wood engraving. Congratulations for the Overwintering Project and I hope it strikes a blow with all who view it. Incredibly these birds know when it’s time to take off for the Siberian springtime to mate. They raise their chicks then return to sunnier climes to overwinter. Expert Bethany Lindsay explains how... ‘complicated processes involving spectrums of light, electron excitation, and constant recalibrations.’ But to me it’s a completely amazing phenomena! 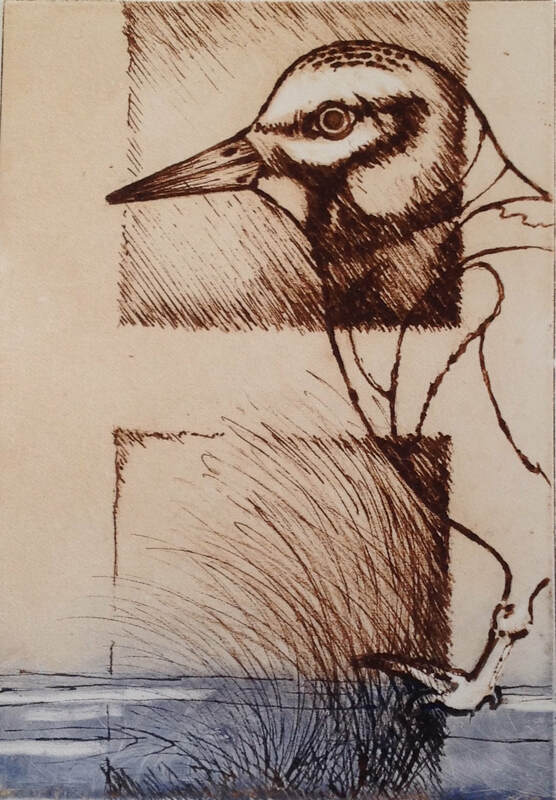 Medium: Lithograph and etching; 2 plates, key plate is a lithograph and the other plate an etching inked in 2 colours. On the sandy northern shore of Southport Lagoon, amid millions of tiny shells, I lie alone in the quiet stillness of the vast amphitheatre formed by water and sky, and bordered by the iconic profile of the distant Southern Ranges. Small numbers of Red-necked Stints, Red-capped Plovers, Double-banded Plovers, Hooded Plovers, Pied Oystercatchers, Sooty Oystercatchers and, very occasionally, Bar-tailed Godwits forage unconcernedly across the wide sandflats left by the receding tide. It is a remote, isolated place of great beauty and peace which has always inspired me. And I marvel at the resilience of the tiny birds which have reached this final southern outpost of their journey. 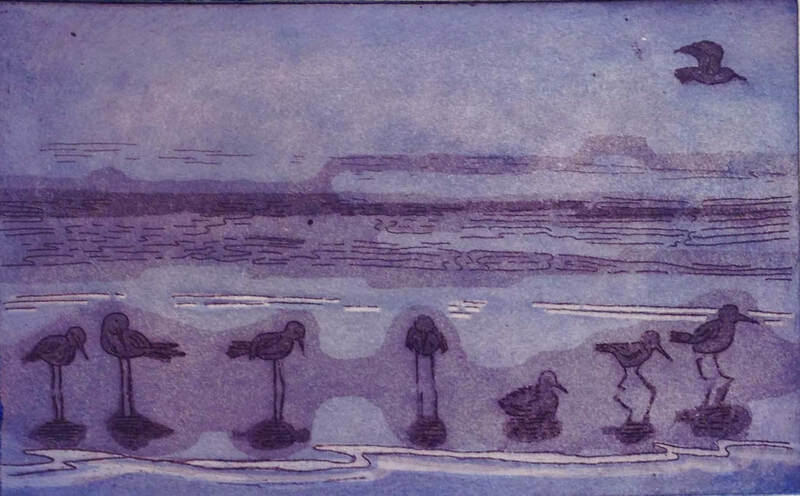 Printing with collagraphs enables a range of tonal effects which suits this print. I feel they can convey an emotional charge, and in this print, enhance the sense of remoteness and also impending loss. Site: Southport Lagoon is a large saltwater lagoon situated 110 km south of Hobart, in the Far South region of Tasmania. It is located in the Southport Lagoon Conservation Area, and reached by a 7 km train ride on the historic Ida Bay Railway, then a ¾ hour walk on a moderately easy trail which ends on the white beach at the northern end of the lagoon. When the tide is out, a few of the most hardy migratory shorebirds and waders are attracted to the vast sand/mudflats revealed. Whimbrels are shorebirds of the East Asian-Australasian Flyway which don’t have webbed feet - as seabirds do. The need for stability whilst feeding in mud and soft wet beach sands of the intertidal and wetland fringe zones necessitates a broad splay of toes for balance whilst walking in, and on, a constantly shifting base. It’s this shoreline that is threatened by industrial development and human interventions. This marginality of place - being a peripheral zone on the land mass - is tenuous, and alluded to by an un-inked embossed ‘ghost’ plate. Verticality of imagery references their north/south coastal migration pathway. 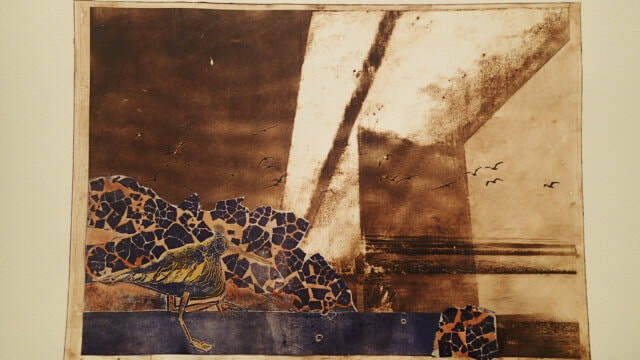 Medium: Intaglio etching, hard ground and aquatint, blind embossing. Site: The whimbrels in my print have been observed feeding and resting at a site on the beach to the north of the lake-channel opening at The North Entrance, NSW. The area has been fenced to protect migratory shorebirds, however people ignore the signage stating this. Unfortunately, human and dog tracks can be seen within the fenced enclosure. 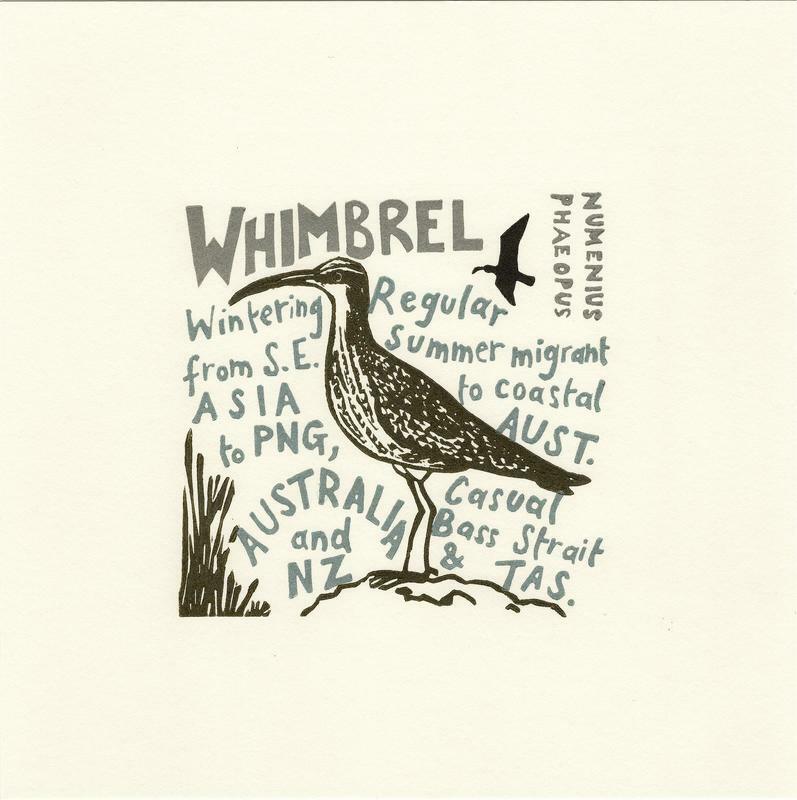 The Whimbrel with its pronounced de-curved beak feed in small groups along the intertidal mudflats of Australia, particularly Stockton Newcastle NSW and is a species of Curlew that breed from North America, Europe, Scotland and Asia. They nestle among the mangroves, almost invisible blending in with the environment. The birds and bees are the pollinators of the world, where would we be without them? They deserve to be treasured and protected. Of particular interest to me are the breeds of tiny plovers that make my heart sing when I see them on our ocean beaches. Plovers with their matchstick fine legs, running in a family group along the tideline is sadly an uncommon view now. The sweet little birds who look like the slightest puff of wind would send them rolling and tumbling along the sand have hearts of warriors and although they have the physical strength to cross oceans they are extremely vulnerable when hatching chicks on ocean beaches. Guard them now before it's too late. These amazing little birds are among the smallest of the calidris waders. They make an amazing journey each year between their summer breeding grounds in the northern hemisphere and and their winter feeding grounds in the south. Traveling through the East Asian-Australasian Flyway to overwinter in New Guinea, Australia and New Zealand and make the same journey back to their breeding grounds six months later. They are classified as Near Threatened due to the loss of staging areas available for use during their migration. The birds stop at many different wetlands and disturbance of one site will affect the entire network of wetlands. Red-necked Stints are highly gregarious, and will form flocks with other small waders They forages in damp mud and very shallow water, an omnivorous species feeding on seeds, insects, small invertebrates, plants in salt marshes, molluscs, gastropods and crustaceans. 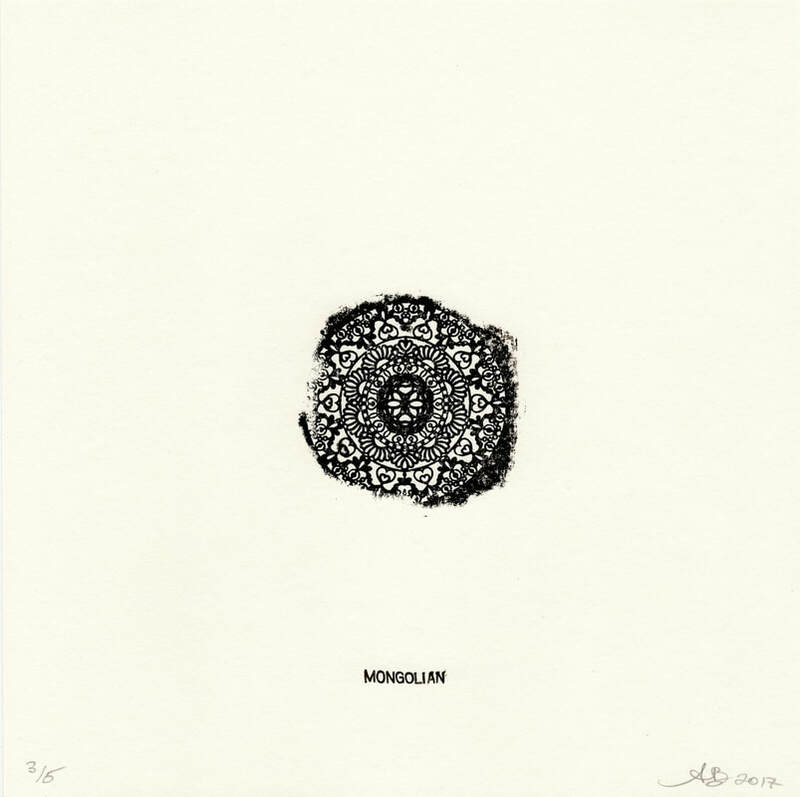 Medium: Waterless lithograph and collagraph. The print features Calidris ruficollis (Red-necked Stint) and the background orange/red colours represent Sarcocornia Quinqueflora (Beaded Glasswort) when close to flowering (mid-to-late April). The Red-necked Stint is the most common overwintering species in South-East Tasmania. The south east is also one of the best locations to see amazing salt marshes, which are a feature in Tasmania. Perhaps if these birds were the size of whales or elephants, it would be easier to protect their habitats. 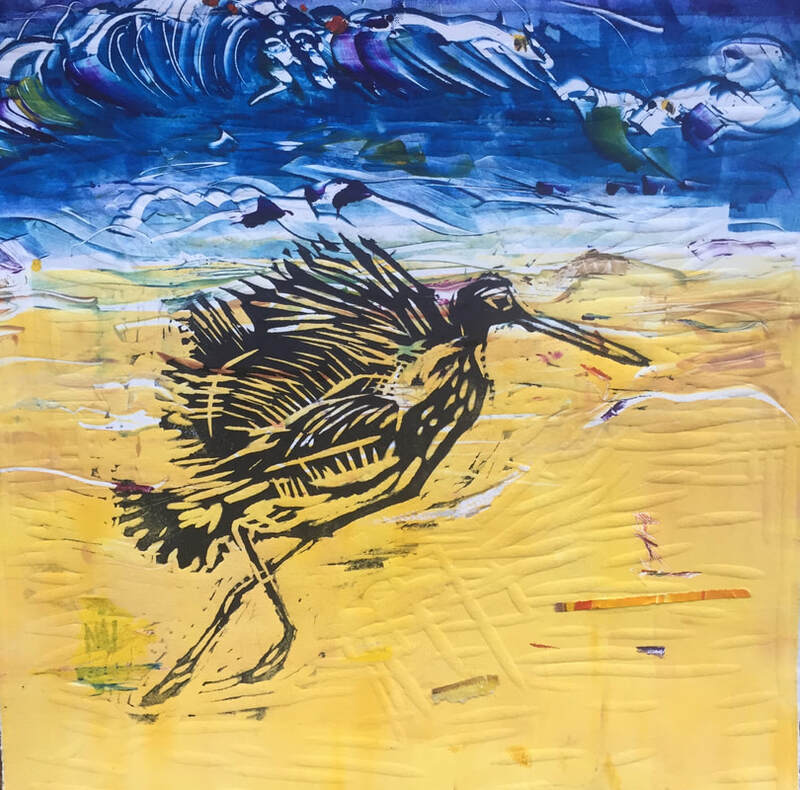 Do the Migratory Shorebirds at Shoalhaven Heads, with 'Cullinghutti' (Mt Coolangatta) watching over, find maps for their return journey to the northern hemisphere in the patterns in the sands and sea grasses…written by the ebb and flow of the tides? My whimsical caption highlights the wonder of the journey these small birds make each year between the North and Southern Hemisphere, travelling up to 16,000kms. How this extraordinary feat of navigation is achieved remains a mystery to science. 'Cullinghutti' is a prominent landmark by the mouth of the Shoalhaven River on the South Coast of NSW. It’s a place of significance to the local Aboriginal community who regard it as a launching place for spirits. It connects the earth with the spirit world. The mountain makes a very appropriate backdrop to the epic journey these remarkable birds make across the heavens. 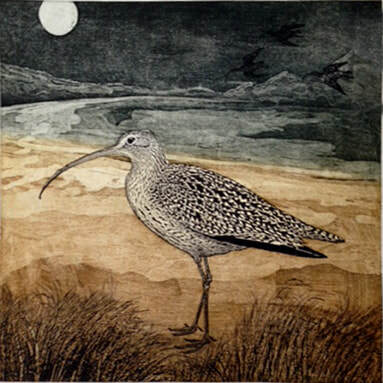 I have chosen the Eastern Curlew because it is critically endangered. This large wading bird has a very long black bill useful for the bird to forage in shallow waters where seagrass or seaweed is found, eating crustaceans such as crabs. The flight path of the Eastern Curlew must include a chain of wetlands from Russia and North East China, so that they are able to rest and feed. They arrive in Australia along the coastlines and in estuaries and mudflats during the non-breeding season in the north, east, and south east of Australia. I found the long bill inspiring for the artist because of its elegance and beautiful shape. 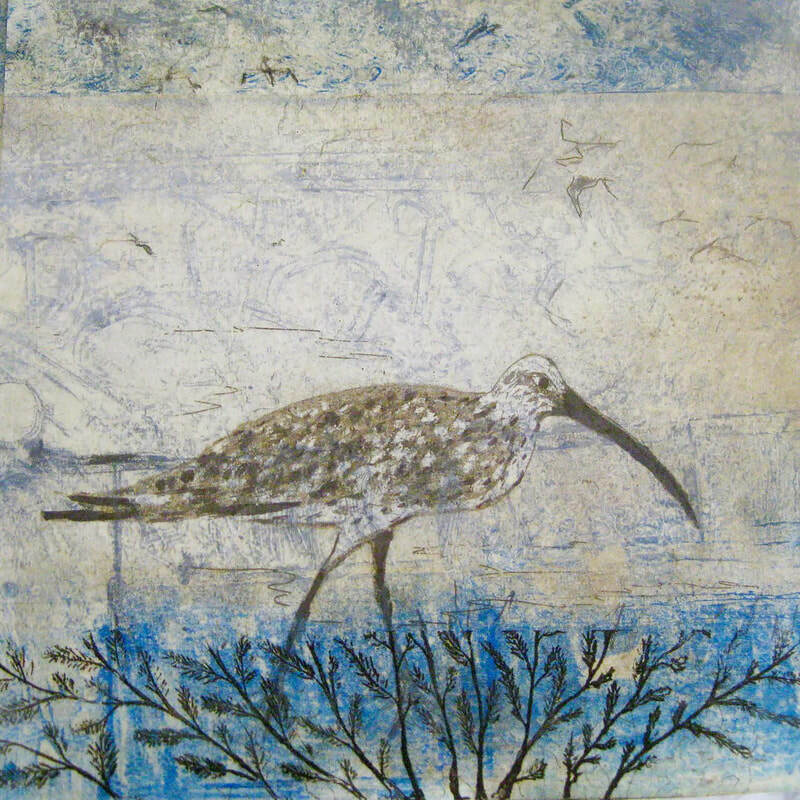 To reinforce the idea of the Eastern Curlew’s habitat, I placed my bird among the seaweeds. 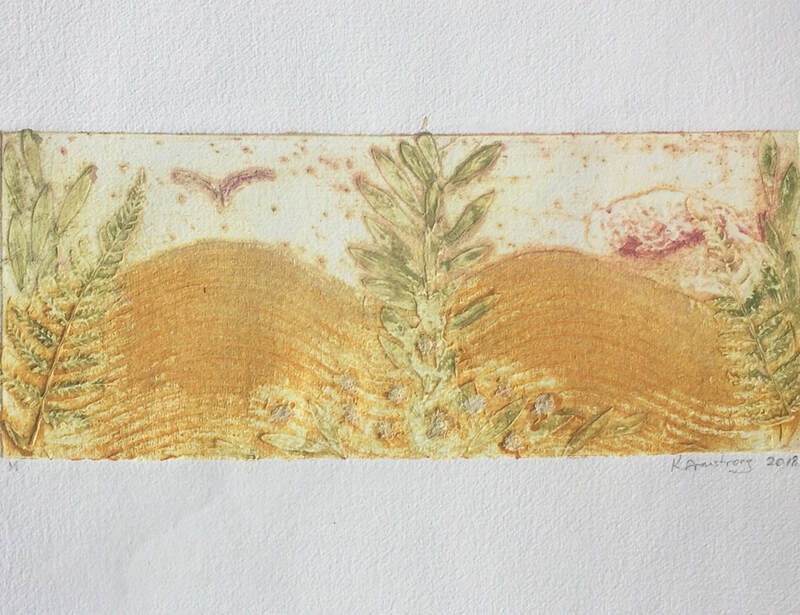 Medium: Mutiplate etching and collograph. 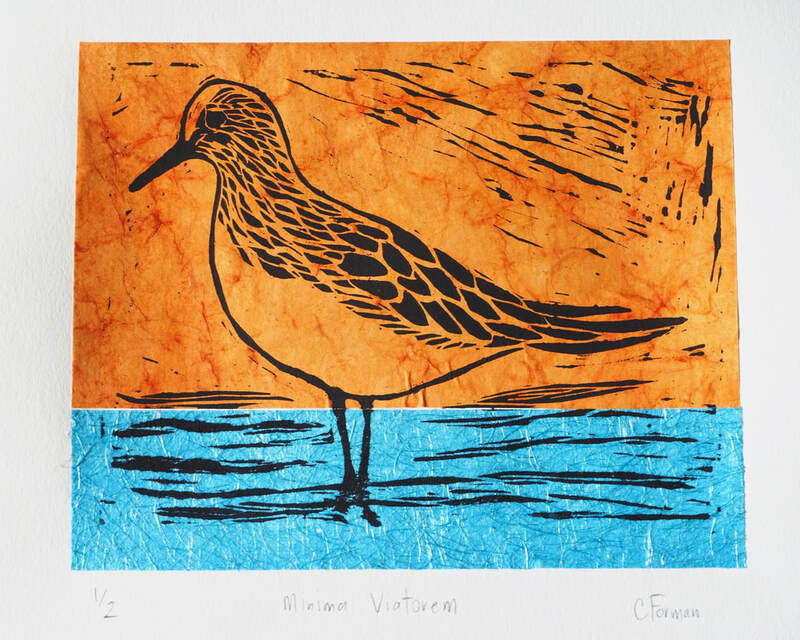 In October a group of printmakers gathered at Flinders Ocean Beach to see the local migratory and resident shorebirds. 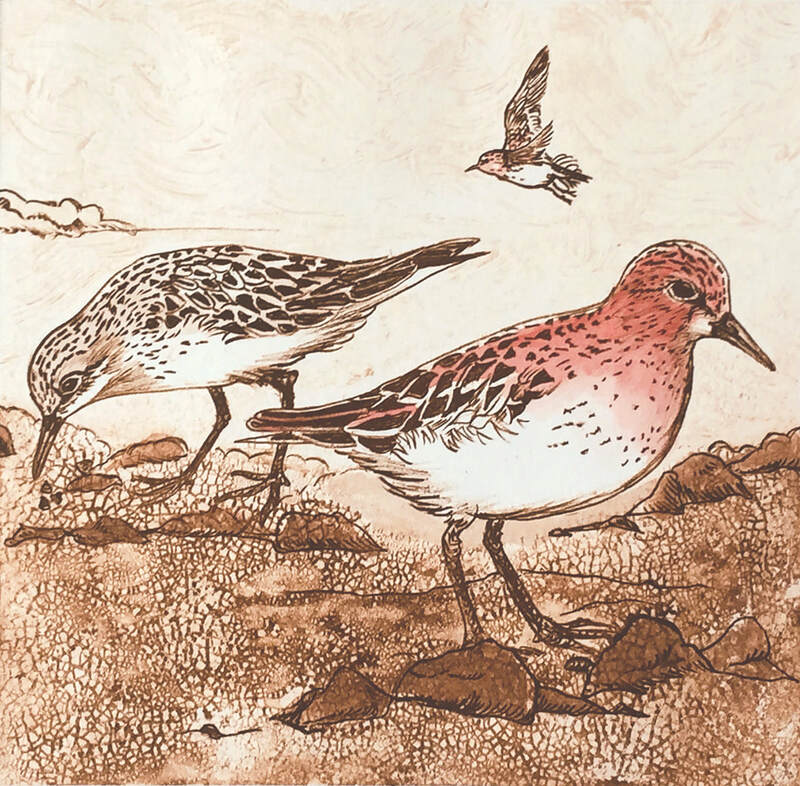 We were very lucky to have a spotting scope that made it possible to see a large group of Red-necked Stints that consequently inspired this print and the circular format. Red-necked Stints are very small birds, approximately 15cm in size, and hard to spot as their brown bodies blend very well with the brown of their overwintering habitat in the intertidal area. Some were roosting on all the washed up seaweed, shells and debris. Others were running down to the waters edge and back as the waves came in. We were able to observe them from a distance with the scope as they carried on their daily activities. It is amazing that these little birds can fly to the other side of the globe to their breeding habitat then find their way back to the same location.